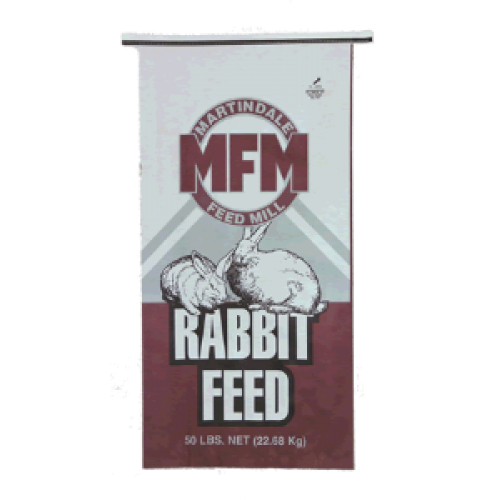 INGREDIENTS: Dehydrated alfalfa meal, wheat middlings, soybean meal, roughage products (20%), grain products, yeast culture, salt, calcium carbonate, monocalcium phosphate, dicalcium phosphate, vitamin A acetate, vitamin D3 supplement, vitamin E supplement, menadione sodium bisulfite complex (source of vitamin K activity), vitamin B12 supplement, riboflavin supplement, d-calcium pantothenate, niacin supplement, choline chloride, thiamine mononitrate, pyridoxine hydrochloride, folic acid, ethoxyquin (a preservative), ascorbic acid, biotin, manganese sulfate, manganous oxide, ferrous sulfate, copper oxide, copper sulfate, cobalt carbonate, zinc oxide, zinc sulfate, calcium iodate, sodium selenite. 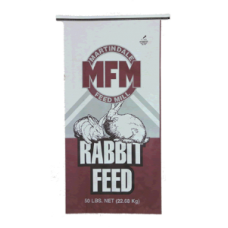 FEEDING DIRECTIONS: Feed free-choice to growing rabbits and non-breeding adults. Always provide plenty of fresh, clean water. Clean cages, feeders and waterers frequently.